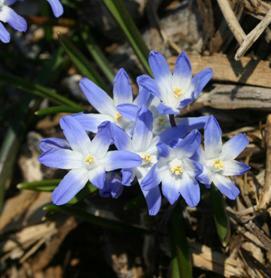 Glory-of-the-snow typically produces flat, star-shaped flowers that are pale blue with white centers. What is glory-of-the-snow? 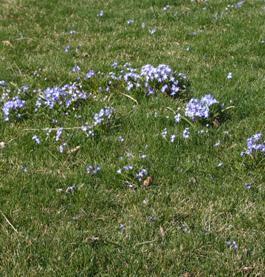 Glory-of-the-snow (Chionodoxa forbesii, formerly known as C. luciliae or C.
What is glory-of-the-snow? Glory-of-the-snow (Chionodoxa forbesii, formerly known as C. luciliae or C. gigantea) is a small bulb-producing plant native to western Turkey. 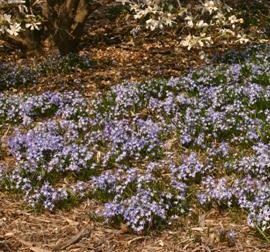 It is closely related to (and was formerly included in) the genus Scilla, commonly know as the squills (see University of Wisconsin Garden Facts XHT1166 for more information on Siberian squill). 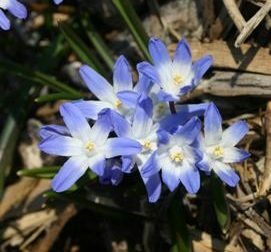 The genus name Chionodoxa is derived from the Greek words “chion” (meaning snow) and “doxa” (meaning glory) and refers to the fact that the plant blooms early enough that its flowers sometimes poke through the snow. Glory-of-the-snow is hardy in zones 3 through 8. Glory-of-the-snow produces small, upward-facing, star-shaped flowers that are pale blue with a white center. Flowers are ½ to ¾ inches wide and have six petals/sepals that spread nearly flat. Each bulb produces a raceme of five to 10 flowers on brownish stems. 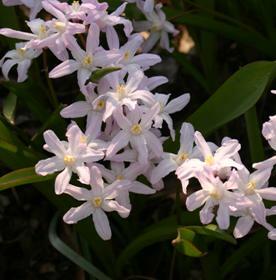 In addition, bulbs produce clumps of mid-green, strap-like leaves that die back in the summer. The plants grow approximately six inches tall. •‘Pink Giant’ which has pink (actually more lavendar) flowers that are smaller and bloom earlier than the blue variety of glory-of-the-snow. •‘Pink Giant’ was given the “Outstanding Plant Award” by the Royal General Bulbgrower’s Association in Holland. Where do I get glory-of-the-snow plants? This ornamental is best initially established by planting bulbs that can be purchased at your local garden center. Select bulbs that are large, firm (not soft), and free of gashes and other blemishes. Avoid bulbs showing any signs of fungal growth (e.g., colorful masses of spores) on their surfaces. 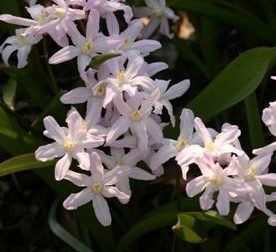 Once established in a garden, glory-of-the-snow can be propagated by dividing bulbs (i.e., removing daughter bulbs from mother bulbs and replanting) or simply allowing the plants to self-seed. Seed can also be collected by allowing pods to dry on the plant, then breaking them open. Collected seed can be directly sown outdoors in the fall. How do I grow glory-of-the-snow? Plant glory-of-the-snow in the fall, placing bulbs in full to partial sun in well-drained soil. Plant the bulbs approximately three inches apart and two to four inches deep. How do I use glory-of-the-snow most effectively in my garden? Glory-of-the-snow works well in perennial beds. Glory-of-the-snow plants are small. However, because they emerge and bloom so early in the spring (before many other perennials begin to grow), they do not have to be restricted to just the front of a flowerbed. Glory-of-the-snow combines well with daffodils (Narcissus spp. ), grape hyacinths (Muscari spp. – see University of Wisconsin Garden Facts XHT1177), crocus (Crocus spp. ), and other small spring-flowering bulbs. In addition, glory-of-the-snow can be naturalized in rock gardens, woodlands or lawns. Because it is unaffected by juglone (see University of Wisconsin Garden Facts XHT1017, “Black Walnut Toxicity”), glory-of-the-snow is particularly useful as an ornamental around walnut trees. 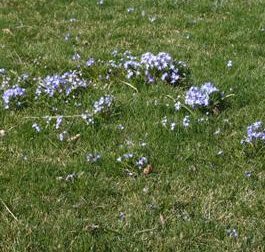 When naturalizing glory-of-the-snow in a lawn, postpone mowing the area until the foliage begins to die back (about five to six weeks after emergence) or be sure the mower blade is set high enough to avoid removing too much of the leaf tissue. Finally, glory-of-the-snow flowers sprays can be cut and used for tiny bouquets. 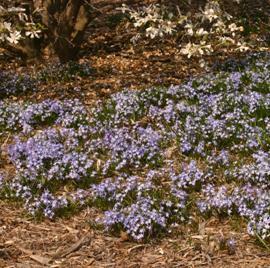 Glory-of-the-snow easily naturalizes by self-seeding both under trees and shrubs in wooded areas, and in lawns.